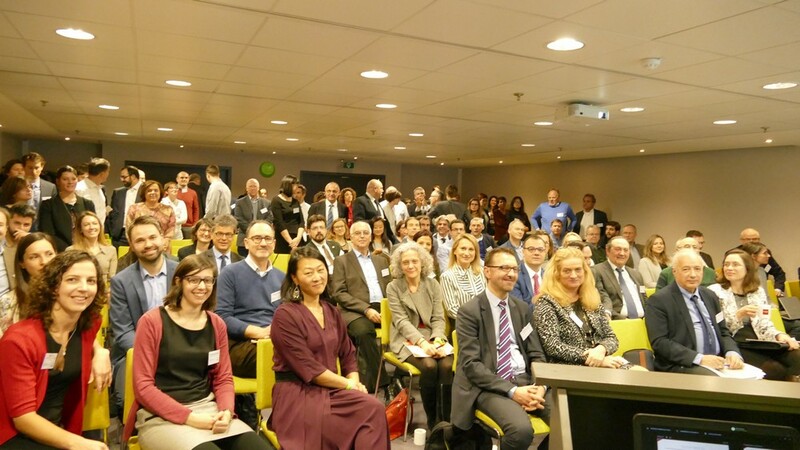 On 21st February 2018, DG GROW of the European Commission has officially launched the 23 newly established "European Strategic Cluster Partnerships for Going International" (ESCP-4i) for the period 2018-2019 and organised, in the context of the Second European Industry Day, a major "Clusters Go International" partnering event gathering the new and previous cluster partnerships to share experiences on boosting SME internationalisation. Overall, this initiative encourages clusters in Europe to develop a 'European' strategic vision and work concretely together by sharing resources and knowledge to target international markets jointly and boost SMEs access to global value chains. This Partnering Event, which gathered over 100 cluster representatives, was a major opportunity for the 23 newly established EU Cluster Partnerships to learn from the 1st generation of EU Cluster Partnerships (2016-2017) that worked on developing and implementing joint internationalisation strategies for the benefit of their SME members over the last two years. The 1st generation of EU Cluster Partnerships showcased achievements, best practices, successful partnership strategies and also some of the pitfalls to avoid. This includes details on a range of new tools and innovative collaboration methods for enhancing project outcomes that could help inspire other cluster organisations such as the creation of Gateway Service offers, SME Export Groups, SME Challenge Pitches, Cluster Ambassadors. An overview of the key achievements of the 15 EU Cluster Partnerships (2016-2017) with a summary fiche for each partnership can be found here. The overall achievements prove the success of these partnerships: over the past 24 months, about 2000 European Small and Medium Enterprises (SMEs) have been involved in activities targeting international third-markets generating 85 concrete business cooperation cases with international partners, 370 Cluster-to-Cluster meetings and 3010 Business-to-Business meetings have been conducted, whilst 39 Memoranda of Understanding (MoU) have been signed and 45 collaboration projects implemented between EU clusters and international peer organisations. To identify opportunities to organise joint meetings between Partnerships, Business-to-Business, trade shows and missions in order to exploit synergies and economies of scale. Specific EU Services to support the implementation of these Cluster partnerships have also been presented including the EU SME IPR Helpdesk, the European Observatory for Industrial Change and the European Cluster Collaboration Platform (ECCP). Details of these recommendations and services can be found in the various speaker presentations here (see at button “attachments”). The afternoon session was dedicated to the official launch ceremony of the 23 new EU Cluster Partnerships (see all list here). All these partnerships have been awarded the label of "European Strategic Cluster Partnership for Going International" by the DG GROW Deputy Director-General Antti Peltomäki of the European Commission which commits the partners of each EU Cluster partnership to work on a joint cooperation agenda with the aim to support the internationalisation of their SME members. This was followed by a presentation from Christophe Guichard, Team Leader on Cluster Internationalisation of DG GROW highlighting the characteristics of the 23 new projects and setting out a vision for the new Partnerships. The final session, moderated by the ECCP team, allowed the Cluster partnerships to gather in roundtables to discuss potential synergies between partnerships in 10 main target markets. In addition to the more obvious collaboration ideas between partnerships from related sectors discussions showed potential synergies between partnerships focusing on packaging and mobility, photonics and energy, cosmetics and food, etc. Partnerships interested in the Canadian market highlighted several potential synergies such as between the food and packaging sectors, photonics and energy and natural resources. Meanwhile, the partnerships focused on the US market showed interest in the proposed ECCP Matchmaking Mission planned for the Vienna Utility Week in November and cooperation in the energy, cleantech and mobility sectors. During the evening an informal networking cocktail was organised and co-hosted by the European Cluster Collaboration Platform and the German Region Rhineland-Palatinate, with an opening address by Dr. Ulla Engelmann, Head of Unit on Clusters, Social Economy and Entrepreneurship of DG GROW of the European Commission and Dr. Thomas Griese, Secretary of State, Ministry of Environment, Energy, Food and Forestry of German state Rhineland-Palatinate. “Aircraft Philipp Group is German SME active in the aviation and aerospace industry. We participated to several business missions led by EACP Abroad. Those missions helped us to connect with potential clients and customers located in North America. Thanks to EACP Abroad, we signed a first contract with Boeing”. “LASER-GO generated leads for companies which resulted in contracts and further agreements on collaboration: on average 2-3 leads per 3 hours of direct contacts during the engagement activities with the counterparts in the targeted markets"
"Urban areas are melting pots of opportunities. The partners of the SmartCityTech partnership are convinced that European smart, digital solutions for urban areas can also make a difference on other continents. The network of ESCP-4i partnerships is a great source of like-minded people with whom we want to join forces during our missions to Singapore, the US and India. During the last ESCP-4i partnering event facilitated by the European Cluster Collaboration Platform in Brussels the first talks with the ESCPs MobiGoin and EC2i were initiated. Follow up meetings are scheduled. Now it’s just a matter of making it happen." All pictures and presentations made during the event can be downloaded here.